IBM Watson may be best known for competing on the US quiz show Jeopardy, but the technology goes far beyond simple questions and answers. Watson is an entirely new form of computing, one that promises to discover hitherto undiscovered insights based on the wealth of data all around us. While traditional computer models have relied on rigid mathematic principles, utilizing software built upon rules and logic, Watson instead relies on what IBM is calling “cognitive computing”. IBM Watson has multiple services that includes Assistant, Discovery, Personality Insights and many more. The Watson team also provides multiple software development kits (SDKs) to help developers use Watson with various programming languages. The watson-developer-cloud GitHub organization has a full listing of available SDKs. An IBM Cloud Account – sign up if you do not have an account. Android Studio installed on a local machine. 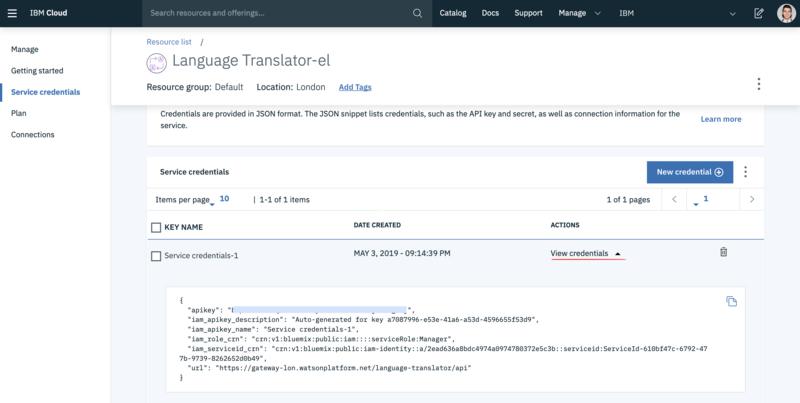 A provisioned Language Translator service on IBM Cloud. A provisioned Text to Speech service on IBM Cloud. To complete the how-to should take about one hour. Thirty minutes for the prerequisites and another thirty minutes for the guide. Navigate to the Watson Android SDK on Github and click the Clone or Download button to download the repository as a ZIP file. Optionally, we encourage the reader to check out the watson-developer-cloud GitHub organization that the Watson team maintains to see all other available SDKs. We’ll now use the example folder in the Watson Android SDK as a starting base. Unzip the newly downloaded ZIP file (probably named android-sdk.zip) into a new workspace folder. Click File > Open in the menu bar and provide the example folder of the un-zipped file. Note: If you see a Install missing platform(s) and sync project error or Install Build-Tools 26.0.1 and sync project error, then click the hyperlink provided to install the missing platform or tools. Once installed the build should restart and complete successfully. 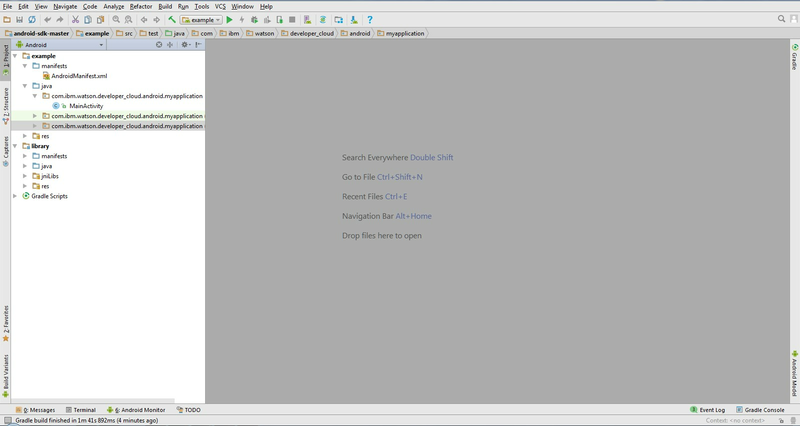 Let’s now take a look at the sample application provided in the SDK. Specifically, let’s open the file MainActivity.java, which is located at example > java > com.ibm.watson.developer_cloud.android.myapplication > MainActivity. By expanding the import section at the top of the file (clicking on import ...) you’ll be able to see the various imports used in MainActivity.java. Note the ones used by the watson_developer_cloud package, the Watson Android SDK. To quickly see a complete list of other Watson services you can use, type in import com.ibm.watson.developer_cloud. and let the auto-complete show you what is available. Now let’s check out activity_main.xml, which is located at example > res > layout > activity_main.xml. This XML file contains the layout for MainActivity.java. By double-clicking activity_main.xml Android Studio will automatically generate a sample design of the activity for the application. You can also edit this design by clicking Text at the bottom left corner of the tab to see the XML written. Lastly, let’s check out credentials.xml, which is located at example > res > values > credentials.xml. This XML file contains a template for providing the credentials for the various Watson services that are used by the application. In this case, there are three different Watson Services used; Watson Language Translator, Speech to text, Text to speech. Each value in the XML file contains a resource name that can then be referenced from MainActivity.java. We now copy and paste the credentials for each Watson service to credentials.xml. Refer back to the Prerequisites section for instructions on how to create specific Watson services. To find the service credential value, log into IBM Cloud and find the service in your dashboard, once selected go to the Service Credentials tab. The image below is the Service Credentials tab for a Language Translator service. Copy the url, username and password for each service and paste them in into credentials.xml in Android Studio as shown below. Do the same for other services as well. After providing the credentials for all three Watson services (Language Translator, Speech to Text, Text to Speech) we can now build and run the project. We can either run the application via a connected device or build the APK first and transfer it to a mobile phone to be installed manually. Let’s look at both methods. Running an Android project on a connected device is an efficient way of debugging projects. 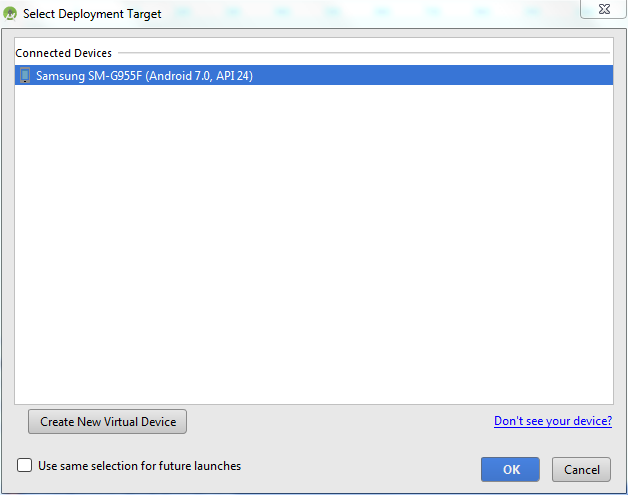 It requires the relevant drivers to be installed on both the mobile device and Android Studio. It also requires the user to enable developer mode on your mobile device. We must first download and install Google USB Driver on Android Studio. Note, that if you are developing on macOS or Linux then you do not need to install the USB driver, instead refer to Using Hardware Devices. In some cases, additional drivers are needed. When creating this guide, which was tested on Samsung Galaxy S8+ running Android version 7.0, we had to install USB drivers for Samsung on Windows. Finally, the last step we need to complete to use our device as a connected debugging device is to enable USB debugging. To do so, we need to enable “Developer Mode”. We do this by going into the device’s Settings selecting About Phone, then Software Information, and tapping Build number seven (7) times. Now go to Settings and a new menu, Developer Options will appear, enable USB Debugging to continue. You should see your connected device in the Select Deployment Target dialog as shown below. Click OK and the project will start building and run on the connected device. To install the application as an APK we must first generate the APK. To do so, go to Build and select Build APK. Android Studio will start building the project and generate an APK. After the process is complete, you can go to the APK location by clicking Show in Explorer in the Event Log shown below. Transfer this APK file on your mobile device by any means you like (E-mail, sd card, Google Drive, etc). Open a file explorer on your mobile navigate to the location of the transferred APK. Open the APK file. Android may promt you to allow installing from an unknown source, confirm this choice and the application will start installing on your phone. In the screenshot below a sample text is translated using the Watson Language Translator service. 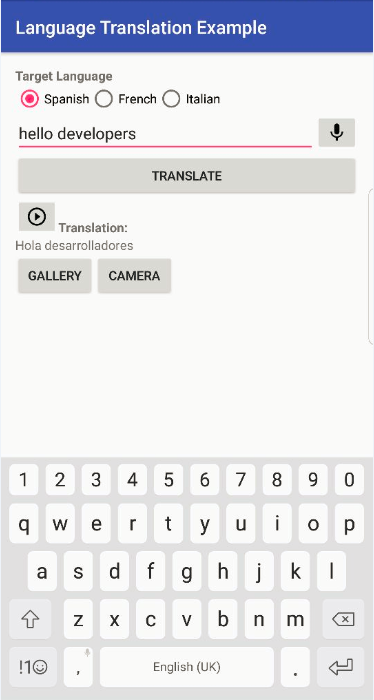 You can choose which language you want to translate your text into. You can also use the microphone to record your input using the Watson Speech to Text service. To do this, click the microphone button next to the text box, say a few words, and click the button again to stop the recording. You can also click the play button to hear the translated text, which uses the Watson Text to Speech service. In this section, we shall see how our input is being translated and how the APIs are being called for translating the text into the selected language. We shall see the case of calling the LanguageTranslator API. This is the call to the Language Translator Service where we are providing 1) the input text, 2) its language of input (default is set to English), and 3) the selected target language. As the showTranslation function is on another thread, separate from the Translation API call we have to add runOnUiThread, which puts it in the queue and executes after the Translation API call and sets the returned text of translation. Other API calls work in a similar fashion. Kindly refer to link provided in the resources for the documentation of the Watson Services and their API References. 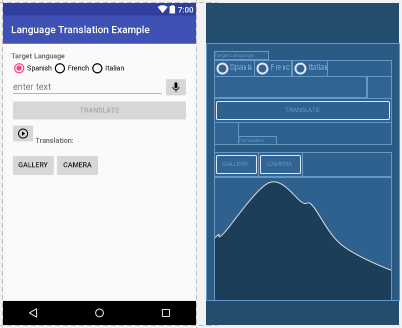 In this guide, we learned how to: get started with the Watson Android SDK, build a sample application using Android Studio and Watson services, and we did a deep dive into the code base. Please refer to the the links provided in the resources to see other SDKs and Watson API references. Thanks for reading! Watson available SDKs A collection of REST APIs and SDKs that use cognitive computing to solve complex problems. Watson Android SDK Android client library to assist with using the Watson services, a collection of REST APIs and SDKs that use cognitive computing to solve complex problems. Watson services documentation and API references Explore documentation and learn how to get started with Watson. Integrate multiple IBM Watson services.